Don’t you just love when you get a great idea and then you realize you already have all of the materials you need to make it? I have been seeing pictures of watering cans that look like they are pouring tiny lights out of them. I tried to figure out how to make the lights work, but then I stumbled upon some beautiful crystals I had been saving for just the right project. 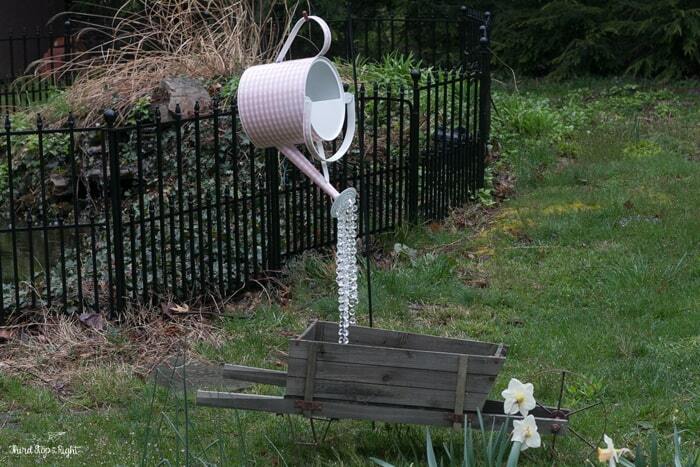 I recently found an adorable farmhouse-style watering can and the craft store that I knew I had to have. I wasn’t sure of the project yet, but knew I would do something with it. I also had some strands of vintage crystals that I had been saving. 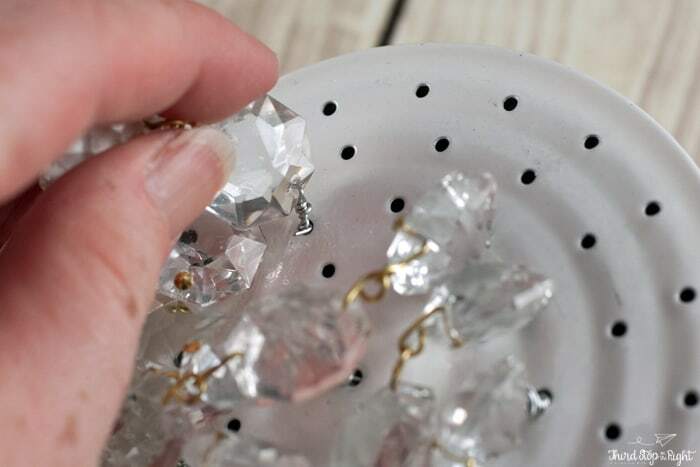 I thought instead of the watering can pouring lights, why not have it pour crystals? 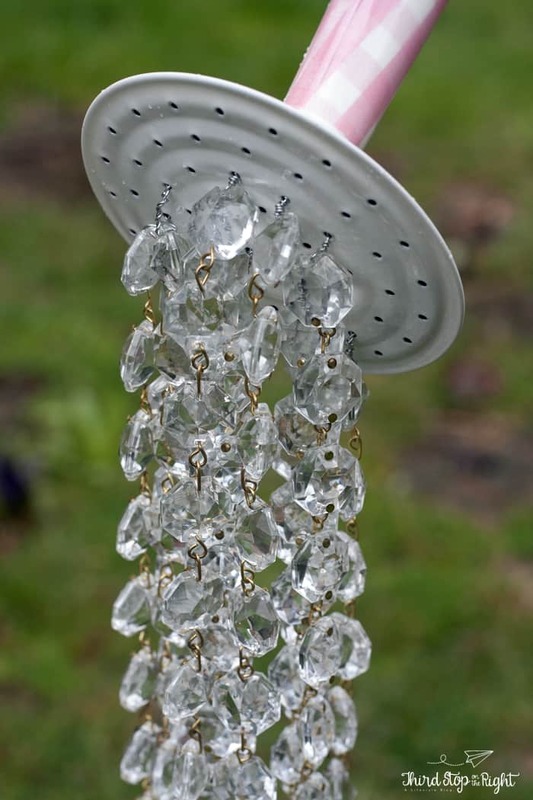 You will only need a few supplies for this project, including the watering can, floral wire, crystals, wire cutters, and small beads. 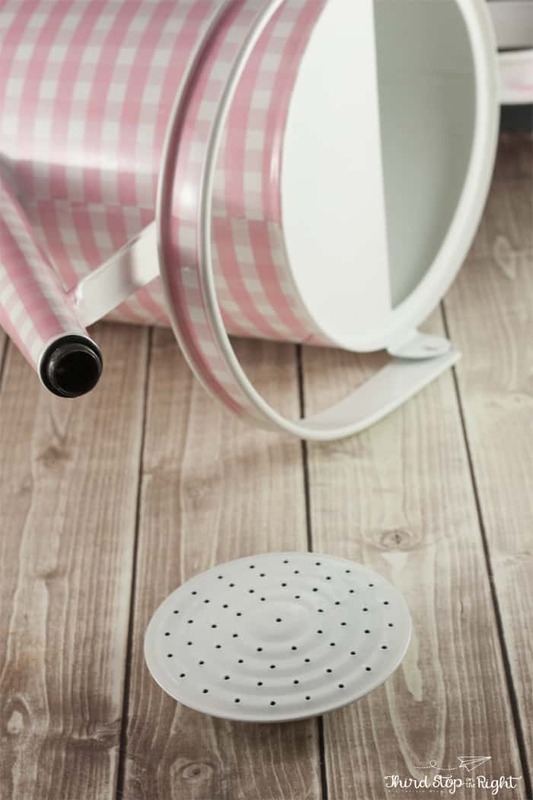 You will want to begin by unscrewing the spout from the top of the watering can. 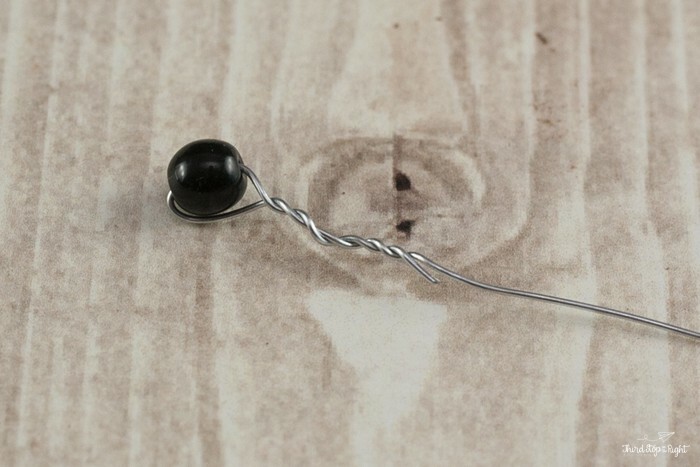 Cut a several inches (around 6-inches) of the floral wire and wire wrap one of the beads on one of the ends. Then place the bead inside the spout of the watering can. 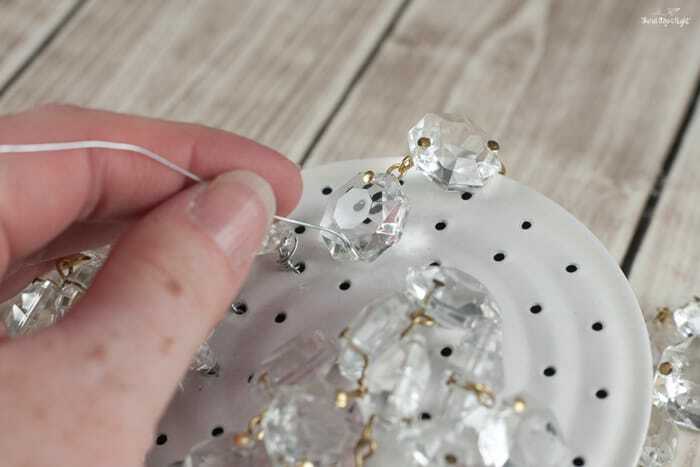 After threading the wire through one of the holes in the spout you will want to attach the string of crystals and wire wrap them to secure them. 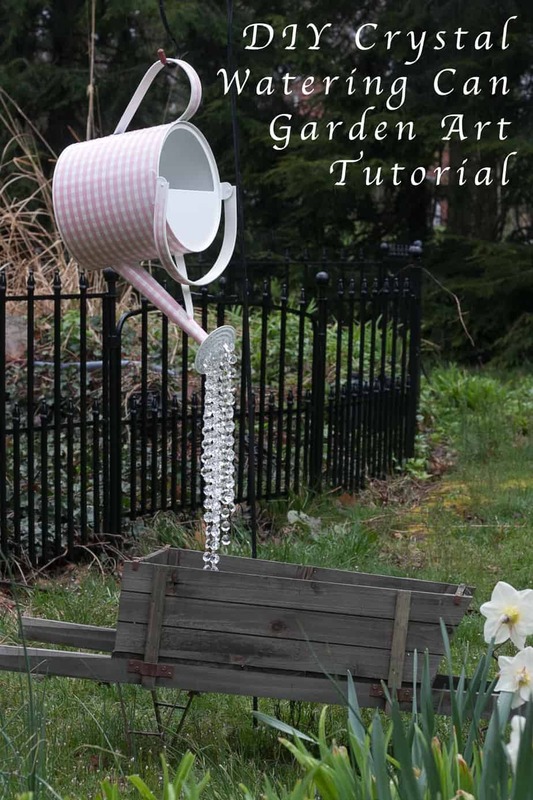 Fill as many of the holes of the spout of the watering can. 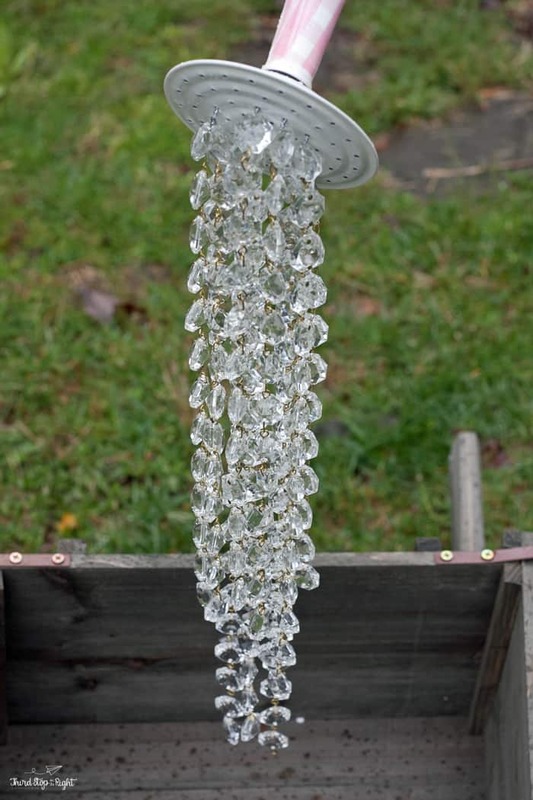 I made my strands of crystals different lengths so it actually looks like the water is pouring out. 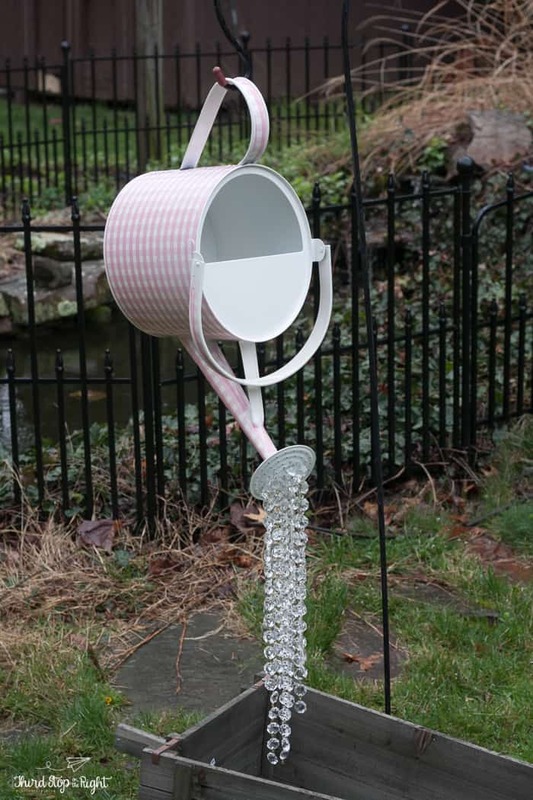 I knew that this would be a beautiful garden feature, something I am working on this summer, and I knew it would be perfect to pair with a wooden wheelbarrow I found from Wayfair. I used a shepard’s hook plant holder that I already had and hung the watering can on the hook so it looked like it was pouring down into the wheelbarrow. I plan on filling this wheelbarrow with a bunch of flowers come this summer. These flowers will also be a great way to attract bees and butterflies to my backyard garden. 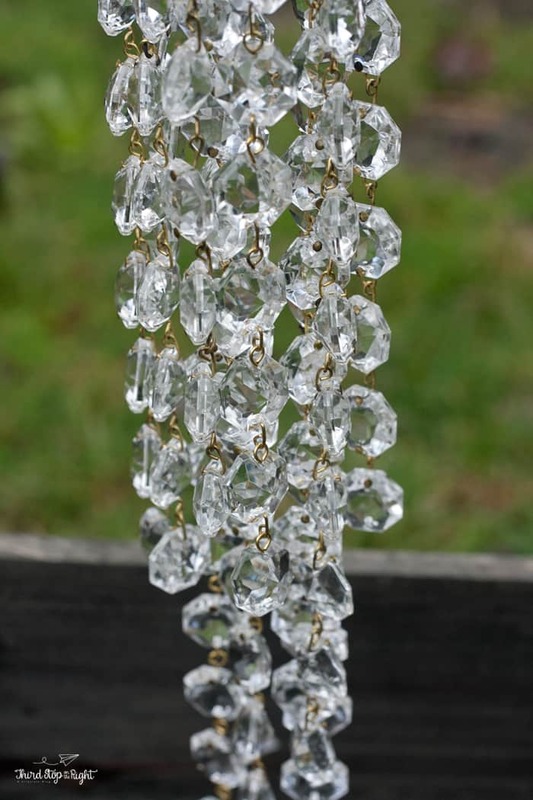 I love how this project turned out, but I am particularly excited that I was finally able to use the vintage crystals that I had been saving. I knew that they would come in handy eventually!